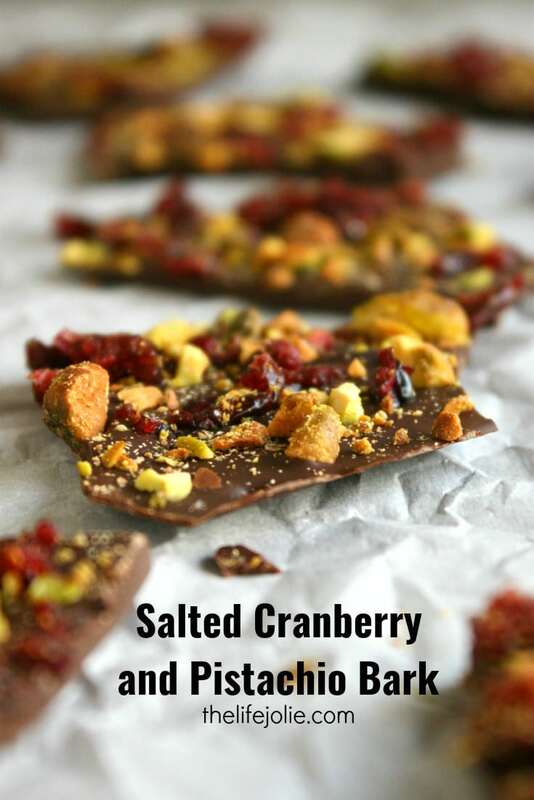 This Salted Cranberry and Pistachio Bark recipe could not be more delicious! 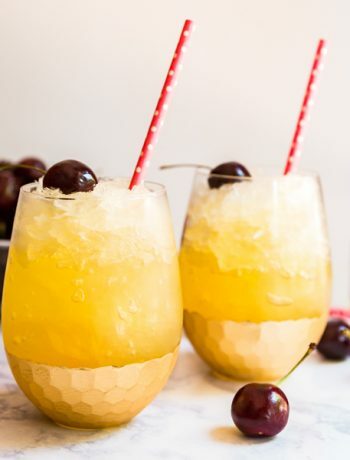 It’s insanely easy to make and the salty-sweet flavor combination cannot be beat! It’s perfect for the holidays and makes a great gift! One of the quintessential candy items that I come across so much during the holidays is bark. While I’ve never made it, my mom has many times and it’s always so delicious! I tend to steer clear of the usual peppermint bark because although I love the mint/chocolate flavor combo, I’m really not a white chocolate fan. But I’ve been loving the idea of creating bark with a different flavor profile, in this case Salted Cranberry and Pistachio Bark. To me, Cranberries and Pistachios scream holidays. There’s something about the tart, flavor in the cranberries mixed with the crunchy, salty pistachios that I find myself going back to again and again! So of course they were a natural addition to my bark. When choosing the chocolate for the bark, I opted for a nice, high-quality dark chocolate because dark chocolate will always have my heart. I love the dry, almost fruity notes that you find in dark chocolate; the complexity is everything to me and pairs so nicely with the cranberries. I find most barks to be too thick so I kept the chocolate on the lighter side. If you like a more traditionally thick bark, you’ll simply double the amount of chocolate in my recipe. But the real clincher in this is the salt. Now I’m not one to dump salt on everything I eat (at least try it first!). But the salty-sweet flavor combo is such a win in so many ways that I couldn’t resist sprinkling a tiny bit of sea salt over the top. I think flake salt is ideal for this, but it was 9pm when I made this and my sea salt was finely ground. I made a point to sprinkle it on sparingly from a decent height so that it spread out well instead of concentrating a large amount of salt in one spot. Less is totally more in this case and it came out beautifully! 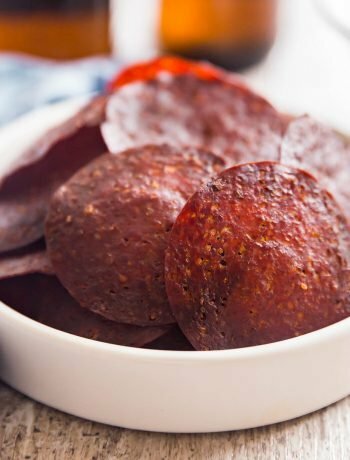 The salt added a great savory note that really elevated this bark! This can absolutely be made in advance and frozen (speaking from experience- that seems to be the refrain of my Christmas baking each year!). It’s a lovely addition to any cookie platter! 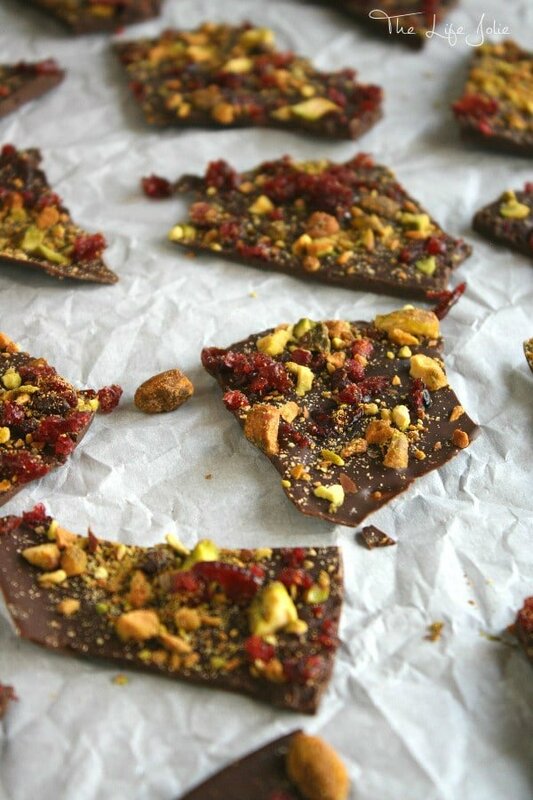 This Salted Cranberry and Pistachio Bark recipe could not be more delicious! 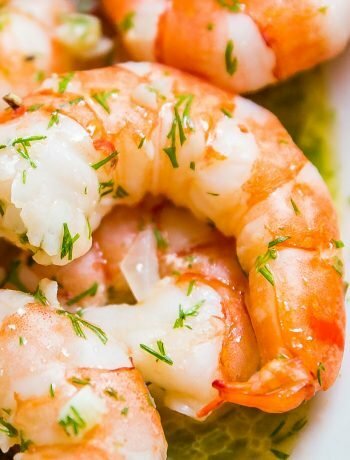 It's insanely easy to make and the salty-sweet flavor combination cannot be beat! It's perfect for the holidays and makes a great gift! In a double boiler (or a heat-proof bowl over a simmering pot) melt your chocolate over medium heat, stirring frequently. Slow and steady wins the race when it comes to melting chocolate. If the heat is too high or if any water makes it's way into the chocolate, it will seize and take on a very undesirable clay-like quality. If this happens, you'll need to start over (you can still use the seize chocolate for recipes that involve adding chocolate to bake- but it won't be good for this purpose any longer). Once the chocolate is melted, spread it into a thin layer on a parchment-lined baking pan. Sprinkle with the cranberries and pistachios and then very lightly sprinkle with salt. Chill for several hours or until solid and break into pieces. Enjoy! 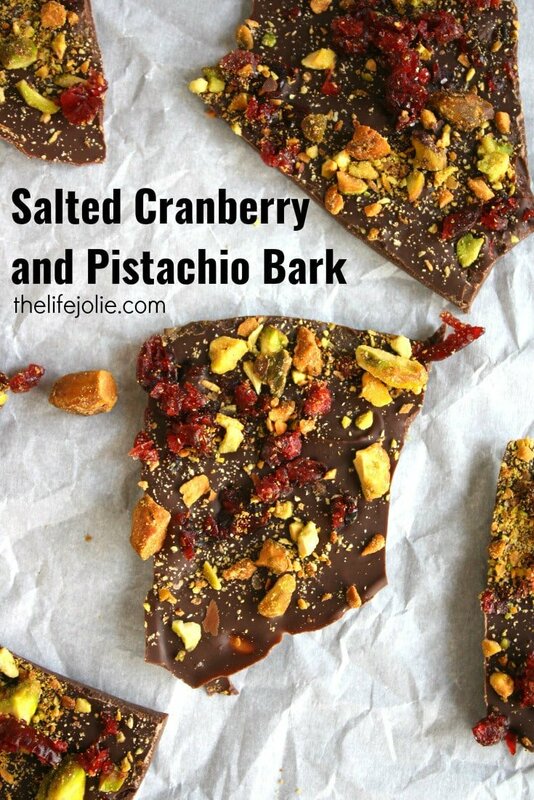 December 21, 2015 at 10:07 am This sounds amazing, I love pistachios and cranberries! I think this would also make a great gift for someone who "has everything". December 21, 2015 at 10:20 am Love Christmas time and all the cookies/etc. Bark is one of my favorites too! Scott recently posted...12 Days of Christmas. Netflix Style. December 21, 2015 at 11:20 am It's dangerously addictive! December 21, 2015 at 11:38 am Looks so delicious and festive! Perfect for the holidays. December 21, 2015 at 11:43 am Thank you- I do love the added color and texture on the cookie platter! December 21, 2015 at 3:21 pm That looks so good. I am a sucker for chocolate, especially with sea salt! I also love cranberry so this looks like something I would really like. I love the photo's too. Very beautiful. December 23, 2015 at 1:27 pm Thank you so much- I definitely had to force myself to stop eating them so that there would be some left for the cookie platter tomorrow! December 23, 2015 at 1:26 pm Thank you! I'm with you- there's nothing like the sweet and savory flavor combo!